Bruxism is the medical term for grinding the teeth and clenching the jaw. It is a common condition that also affects children and adults while they're awake. However, most cases of teeth grinding occur subconsciously during sleep. Bruxism is found more often in people with certain personality types such as aggressive, competitive, or hyperactive. It is sometimes found to be a coping strategy for stress or anxiety similar to lip biting, cheek biting, tooth tapping, and object biting/chewing. Bruxism can also be caused due to consumption of alcohol, caffeine, tobacco, and psychiatric medications for anxiety and depression. These substances often increase arousal during sleep. In children Bruxism has been found as a response to pain from earaches or teething. Some physical conditions can lead to bruxism like stomach acid reflux or an abnormal alignment of the upper and lower teeth. Stress Management & Relaxation: If teeth grinding is caused because of stress or anxiety, professional counseling or using strategies that promote relaxation, like taking a warm bath before bed, exercising, or meditating may help. Behavioral therapies and muscle-relaxation exercises can be effective in managing the symptoms associated with bruxism. If you notice that you clench or grind your teeth during the day, position the tip of your tongue between your teeth. This will train your jaw muscles to relax. Minimize caffeine and alcohol and avoid chewing gum as jaw muscles tend to get more used to clenching during such activities, which makes you more likely to grind your teeth. You may also want to turn off the TV and avoid bringing your gadgets to bed with you. Turn down the lights while getting ready for bed to help increase your body's natural melatonin. Splints & Mouth Guards: These are constructed of hard acrylic or soft materials that fit over your upper or lower teeth, and are designed to avoid damage caused by grinding and clenching. Dental Correction: Correcting teeth that aren't properly aligned may help. 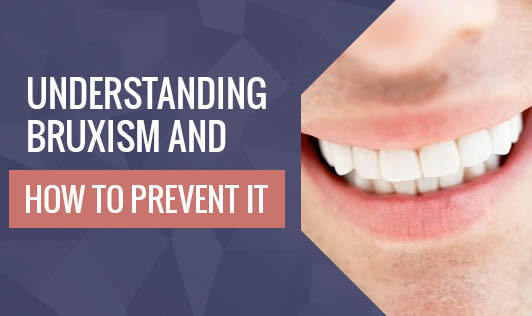 In cases where bruxism has led to sensitivity or the inability to chew properly the dentist may need to reshape the chewing surfaces of the teeth or use crowns. In certain cases, your dentist may recommend braces or oral surgery. Many adults don't grind or clench their teeth badly enough to require therapy and many kids outgrow bruxism without treatment. However, if the problem is severe, you can try the above options or talk to your doctor about what may work best for you.